AP Open school admissions, open ssc inter admissions 2018, #APOSS #SSC Application Form, APOSS #Inter Application Form, OS SCC,Inter admissions, Fee Particulars, The AP government has established its own Open School Society for admission into SSC and intermediate various courses to be offered in Open School Distance Education System. It is a great opportunity for drop out students to continue their education. The APOSS has been dedicated for Andhra Pradesh state only. 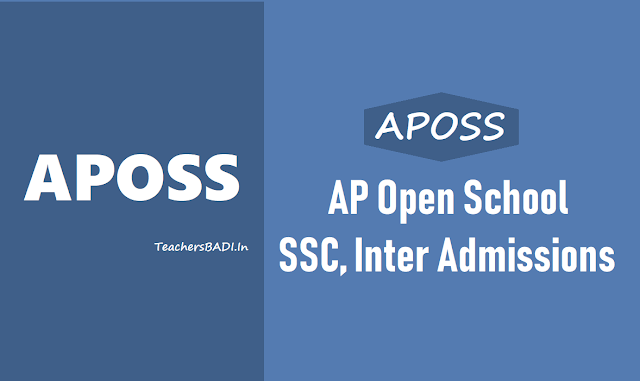 The AP Open School Society that is APOSS will be for AP Open School admissions. APOSS will provide opportunities for continuing education to those who have missed opportunities to complete school and development education; and to other children/persons desirous of pursuing school level education through open and distance learning (ODL) mode by offering courses and programmes of general education, life enrichment and vocational education up to pre-degree level. 1. ఆర్థిక కారణాల వల్ల, కుటుంబ పరంగా కలిగే ఇబ్బందులు వల్ల మధ్యలో చదువు మానేసిన వారు చదువు కొనసాగించేందుకు ఓపెన్‌ స్కూలు ఎంతో దోహదపడుతుందన్నారు. 2. అన్ని సార్వత్రిక పాఠశాలలు, కళాశాలల్లో ప్రవేశాల గడువును అక్టోబరు 15వ తేదీ వరకు ఎలాంటి అపరాధ రుసుము లేకుండా గడువును పెంచారు. 3. ఆంధ్రప్రదేశ్‌ సార్వత్రిక విద్యాపీఠం ఆద్వర్యంలో నిర్వహిస్తున్న ఎస్‌ఎస్‌సీ, ఇంటర్మీడియట్‌లో ప్రవేశాలకు దరఖాస్తులు ఆహ్వానం. 4. దరఖాస్తులను ఆన్‌లైన్‌ చేయించుకున్న తరవాత వచ్చిన నెంబరు ఆధారంగా ప్రవేశ ఫీజులను ఏపీ ఆన్‌లైన్‌లో చెల్లించాలి. #APOSS mission is providing pre-elementary Education through Open and Distance Learning (ODL) mode to School drop-outs and those missing Upper Primary stage of education and to attain Universalization of Elementary Education (UEE) in the State and provide continuing education for adult neo-literates, working men and women to reinforce their functional literacy and not to allow them to relapse into illiteracy. The APOSS Director, Parvathi has given APOSS admission notification for this academic year 2018-2018 for admission into 10th class(SSC) and Intermediate courses through distance mode in their Open school study centers. The candidates can apply for 10th class and intermediate courses. Candidates can apply for these courses upto below given date with a late fee. More details will be updated on the official website or available at study centers. The enrolled students have to appear for the examination conducted by APOSS. There will be separate study material and examination pattern for open school system candidates. The degrees will be considered on par with regular candidates. Eligible for Central or State government Jobs and Eligible for Higher studies i.e., Inter, Degree, EAMCET, B.Tech, Medecine, Agriculture, Law etc and and abroad also. These courses useful to govt/ private employees eligible for promotions. There is no upper age limit for admissions. However,The students age limit should have completed 14 years as on 31st August, 2018. Eligible Candidates can apply through online mode only. So, The filled in Application forms, after certified by the A.I Coordinator, register through Online at Mee Seva centre, by paying requisite fee. Submit the original copy of application along with enclosures at the AI. Take the duplicate copy of application to Mee Seva for updation through online. Take the Admission fee receipt and printout copy of the online Registered application form Mee Seva and preserve it for future reference. If you would like this information please share it..and if you have any doubts on this, please write below in "post a comment section". May I know the Exam Fee for SSC. Sir please extend the inter admission date.i have only chance to do the open inter.sir please understand my situation. Sir how much is late fee for ssc admission? For SC. Category.